Unless we are expanding the definition of "Founding Fathers" to include Eisenhower, I'm going to have to protest. Related: See these posts for discussion of the addition of "so help me, God" to the Presidential oath. With all of the excitement surrounding the Republican and Democratic V.P. selections, I thought our readers might enjoy this. We have already seen a surge on the "blogosphere" with regards to the religious beliefs of the Republican V.P. candidate, Sarah Palin. It is likely that she will continue to be the focus of attention for the next week or so. As a result, I thought it might be beneficial to switch it up a bit. At a 1995 Senate hearing on a proposed constitutional amendment that would have re-introduced school-sponsored prayer, among other forms of state-endorsed and state-subsidized religion, Senator Orrin Hatch argued that] [t]he government should foster spirituality . . . as an antidote to moral decay. Biden replied, "The coin of religious freedom, we must never forget, has two sides." America is one of the most religious nations on Earth, he maintained, precisely because the government has stayed out of religion. In his view, the issue before the Senate was not whether religion was good but whether all Americans, including religious minorities, would benefit from increased government involvement with it. By the way, that statement helps shed some more light on an answer Biden gave at a Democratic presidential debate in September 2007 when he was asked what his favorite Bible verse was. (I thought this was a poor question for a presidential debate, by the way). Biden's answer to this question was: "Christ's warning of the Pharisees." Calling the Sept. 11 terrorist attacks a greater shock to the American psyche than Pearl Harbor, U.S. Sen. Joseph Biden said Saturday that Democrats must demonstrate they can provide for national security to win back the presidency. . .
"The next Democrat, whether it's me or Sen. Clinton or John Kerry, whomever -- the Democratic nominee -- they'd better be able to ante up right in front of the American people two things: security and faith," he said. . . .
Biden also criticized Democrats for their sometimes patronizing approach to religion, saying believers of different faiths don't expect everyone to join them. "They just want to know we respect them," he said. "If we can't negotiate the faith issue, forget it, we won't win." [Senator Joe Biden:] How was it that in '92 and in '96, Bill Clinton could get a majority of the Catholic vote, and 40 some percent of the Christian vote and 78 percent of the Jewish vote, and how was it that that Al Gore and John Kerry couldn't do that? Because I think Democrats have it wrong. They think in order to get that vote, you have to demonstrate you're born again, or you have to quote the bible or you're a religious person. I don't believe that. I think the reason why Bill Clinton won that vote even though they knew he wasn't a paragon of virtue--and Al Gore was--was because when Bill Clinton sat in that fundamentalist pew, that Catholic cathedral, that Jewish synagogue, the guy sitting next to him believed Bill Clinton respected him, and respected his views. The Democratic Party has become elitist. At fundraisers with wealthy guys, they are uncomfortable when I say that. I say let me ask you a rhetorical question: Do you think it's possible for someone to go to a fundamentalist church tomorrow, make an altar call, profess he's born again, and have a high IQ? They all smile. The truth is we have communicated--the elite in our party have communicated--that we really don't respect that. Now theres a reason for that. They are so angry about the polarization of religion by the Christian right that they've said any talk of religion is bad. Well, I think it's about respect and I don't think that we should shy away from counterpunching. Saying hey, wait a minute, you want to talk about values? I'm your guy. Let's talk about values. I really believe with every fiber of my being the vast majority of Americans agree with us-- about how to treat children, about the elderly, about the whole issue about dealing with the environment. We act like these people in the red states oppose us? They don't! Biden, a practicing Catholic, acknowledged that he rarely has talked about religion in his 34-year Senate career, but suggested that would change if he wins the Democratic presidential nomination. Let me also add a quick summary of Senator Biden's record on some major church-state legislation that ultimately became law and some other church-state issues. Biden supported the Equal Access Act of 1984, the Religious Freedom Restoration Act of 1993, and the International Religious Freedom Act of 1998. As the first excerpt listed above indicates, Biden opposed the Istook amendment, a proposed amendment to the Constitution that was designed to reintroduce school-sponsored prayer and to allow other forms of government-endorsed and government-subsidized religion. The Istook amendment was defeated in 1998. Biden criticized a court decision that held that the Pledge of Allegiance with the words "under God" violated the First Amendment. He has spoken against teaching intelligent design alongside evolution in public school science classrooms, and he supported Clinton administration efforts to help public school officials, parents, and students to better understand religion's place in public schools under the First Amendment. The issues that have most engaged Biden in public life draw on those teachings, from halting violence against women to genocide. At a personal level, his faith provides him peace, he says. "I get comfort from carrying my rosary, going to mass every Sunday. It's my time alone," he says. . . . But Biden believes he can bridge much of that divide. "My views are totally consistent with Catholic social doctrine," says Biden, a six-term Democratic senator from Delaware. "There are elements within the church who say that if you are at odds with any of the teachings of the church, you are at odds with the church. I think the church is bigger than that.". . .
"My idea of self, of family, of community, of the wider world comes straight from my religion. It's not so much the Bible, the beatitudes, the Ten Commandments, the sacraments, or the prayers I learned. It's the culture," he writes. . . .
Biden was one of the first Catholic politicians of the Vatican II generation. From 1962 to 1965, the Vatican Council II produced documents that opened the door to ecumenical dialogue, freedom of religion and conscience, and greater involvement of the laity in affairs of the church, including saying the mass in English and more emphasis on individual Bible study. "I was raised at a time when the Catholic Church was fertile with new ideas and open discussion about some of the basic social teaching of the Catholic Church," Biden says. "Questioning was not criticized; it was encouraged." "[A Catholic teacher] led me to see that if you cannot defend your faith to reason, then you have a problem," Biden says. . . .
On the Senate floor, the tough votes also came early and often. In his first term, Biden faced the first of many votes on whether to curtail abortion rights for women. As a freshman Democrat, he was approached by all sides. He told them that while he personally opposes abortion, he would not vote to overthrow the US Supreme Court's 1973 Roe v. Wade decision that gave women the right to terminate a pregnancy. Nor, however, would he vote to use federal funds to fund abortion. "I don't think I have the right to impose my view – on something I accept as a matter of faith – on the rest of society," he writes in his autobiography. . . .
"Joe Biden is one of the most sincere Catholics I've known in my 40 years as a priest," says Monsignor William Kerr, executive director of the Claude Pepper Center at Florida State University. The two men met by chance outside Biden's Senate office and began a conversation on faith and politics that has continued nearly 30 years. Monsignor Kerr recounts a conversation with Biden on Pope John Paul II's efforts to discourage President Bush from going to war in Iraq. He says that Biden told him: "I just have to tell you the pope's wrong on this, I'm going with the president. That was morality, this is politics." Looking back on this decision, he writes, "I made a mistake." He had "vastly underestimated" the incompetence of the Bush administration in its conduct of the war. The "fantasy" of remaking Iraq in the US image was a goal that could not be imposed on a "fragile and decimated country," he writes in his new book. Instead, Biden proposes a partition of Iraq along sectarian and ethnic lines to help restore security for Iraqis – and more robust international diplomacy to help sustain it. Without taking a position on how Catholics should vote, Biden makes a case for staying connected to the church and its culture. "If I were an ordained priest, I'd be taking some issue with some of the more narrow interpretations of the Gospel being taken now," Biden says. "But my church is more than 2,000 years old. There's always been a tug of war among prelates and informed lay members." In 2005, Biden told The News Journal (Wilmington, Del. ): "This is a nation founded on the idea of the separation of church and state. After 200 years, why the hell would you want to start messing with that?" Biden also stated that his religion is "part of my spirituality, part of my identity." However, Biden supports abortion rights and federal financing for embryonic stem-cell research, stances that run in opposition to those of his church. "It was not written to prohibit the government's acknowledgementof God. In my opinion, the court's decision is dead wrong." Pres. Bush's comments last week "supporting the teaching of'intelligent design' alongside the theory of evolution in publicschool science classes has fueled concerns among some of thewall between religion" and gov't ";; could be breached. This is a nation founded on the idea of these paration of church and state. After 200 years, why the hell would you want to go messing with that?" This is only a sample of the wonderful work done by Melissa Rogers. To read the entire piece, visit Melissa's blog here. I am almost certain arguments regarding the question of America’s creation could continue on world without end; but, I wonder to what avail. It is not as though any answers we come up with will convince any of the several sides to the arguments they have been wrong. The problem has more to do with the fact that ideologues begin with an end result in mind and they will never quit until they either die or come down with a terminal case of Althzheimers–no matter what the evidence is against them. I bet the arguments began with the writing of the Declaration of Independence–even before. To me, and maybe I’m all alone here, the important questions deal more succinctly with how we have come to be where we are to day as a result of where our Founders began. For example, "Did the Founding begin with the Mayflower Compact or was it even earlier?" I see an unfolding of ideas that starts far back in antiquity and continues forward which belies the claims of Skinnerian psychology and shows that human thinking does evolve. Nothing is more indicative of that than world history. America is the peaking of the endless human search for self discovery. Plato tells us that Socrates pled, "The unexamined life is not worth living.". I wonder if we can ask that question as it applies to us as Americans. How do people in the rest of the world see us? As I sit here at the keyboard, I am reminded again and again that I am who I am as a result of who I have been in relationship to all that I have learned and of whom I have known. I am evolving to be who it is that I am coming to be. So, how is it that I have come to be the American that I am? 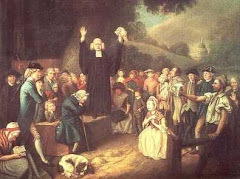 What did George Washington have to do with my being, Cotton Mather, Thomas Jefferson, James Madison, John Hancock, Andrew Jackson, Jefferson Davis, U.S. Grant, Thoreau, Margaret Fuller, Abraham Lincoln, William Jennings Bryan, Dwight Moody, Theodore Roosevelt, Woodrow Wilson, and so many others that I cannot number. But, I do know there is a line that runs throughout history that includes all my ascendents as well as those others that influenced them. I’m reminded of my dear old grandmother and I remember her sitting in her rocker one day singing, "John Brown’s body lies a molting in the grave...". That song had some meaning to her and, so, somehow it contributed to who it is that I have now come to be. What new things are out there impinging on me to make me be what I will be tomorrow? So, I see that this is the way it is for all of us–each one. Whether America was founded as a Christian nation or not, is only of some academic importance. What is important is how we have come to be who it is that we are as a result of our Founding and of all that has evolved since then. Now, as Jon warns us about his Part II on Price, and since the question of the Trinity and Jesus-as-God is perhaps the longest-running theological conflict in Christianity, I admit I'm not terribly interested. By more than a 1000 years, the controversy predates the Founding and even Martin Luther's Reformation c. 1500 CE---so I think the Trinity's impact on the Founding is negligible. Anabaptists were being massacred in Luther's time and backyard over counterscriptural impurities like infant baptism. Massacred with Luther's approval, BTW, when they got too uppity [per Romans 13, I imagine]. Been there, done that. Everybody had an uncle or a grandfather who got cudgeled to death. I'm not aware of any great Trinitarian massacres in the colonies. Richard Price's was a fine mind, and borderline sycophantic when it came to the new America. No surprise the Founders knew him and tuned him in regularly. As is our custom around here, let's look at the record and read Richard Price in his own words, the original source. I'd think his "Observations on the Importance of the American Revolution" [with a Borat-like subtitle of "...and The Means of making it a Benefit to the World"] makes for a level starting point for our joint inquiry. Let's read it. We wouldn't want to take the word of "scholars," after all. Like any of the rest of us, they're not immune to hearing what they want to hear. Best we inquire for ourselves. I might quote from Price's piece, if we get a discussion going. There's a lot of worthy stuff there. 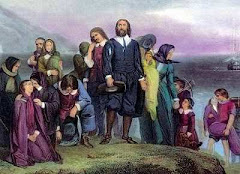 What stood out to me was Divine Providence's hand in the Yankees' victory if not an American "exceptionalism;" a preference for "atheism" over "superstition;" a distaste for Aristotle ["ipse dixit"]; a generic but substantial praise for the significance of Christianity in human history; an objection to government persecuting those who deny the Trinity; and an explicit acknowledgement of a "Messiah who has tasted death for every man." Those italics seem to be his, BTW. Interesting fellow, this Richard Price. I was rereading Christopher Hill's often-intriguing book Puritanism and Revolution and came to his chapter on Hobbes. It seems relevant to the discussion here of Locke and of religion in the American Founding. Hobbes and Locke were contemporaries in adulthood, though Hobbes' writings predate Locke's. Locke certainly was influenced by Hobbes' work. Both men address the question of how to reconcile natural rights, government authority, and religion. For Hobbes, there was no such thing as natural rights. The idea of a "state of nature" is, as Hill puts it, "a logical abstraction rather than a piece of historical description." For Hobbes, humans without government were humans in chaos; the "natural state" was one of want, war, and ignorance. Therefore, when nonconformists in Hobbes' day said that a government that did not respect natural law or natural rights could be legitimately overthrown, or at least not obeyed, he responded that this was nonsense. It is society, organized into government, it is government itself that creates all rights and laws, and so there is no way to use some imaginary pre-civilized era as a control over or yardstick for the legitimacy of a human government. When it is the state itself that creates all rights, then the only way to decide what is just is to have the state decide. This seems like a harsh "might makes right" philosophy, but if you follow it through, it leads to both separation of church and state and religious tolerance. Because politics/government are purely and completely human-made, then religious belief or doctrine has no place in it. We created it, we run it, we make its rules, and we are the final authority over it. Because God is not at all human-made, politics has no place in religion. Humans cannot have authority over God, and therefore humans cannot say which religion is the true religion, and have no authority to persecute anyone for their religious beliefs. In a democracy, then, the people make their own government and give it the right to decide what is just, and pursue religion privately with no government interference. Locke, of course, did not agree with Hobbes that there was no natural law, and no natural rights. And it was Locke who appealed to the American Founders, for his philosophy grants our government a sort of spiritual authority, wrapping our human laws and decisions in the mantle of obeying a kind of cosmic justice. This is what makes it easy for people to rename natural law as God's law, specifially Christianity. We say, our laws are rational products of the Enlightenment, but they are also tapping into God's law, the world God made for humans before we started making governments. We're living how God meant us to live. I think the Founders generally took the view that in creating our democracy they were fulfilling not only their human potential, but restoring cosmic justice. But they remained a little Hobbesian, too. I think the Founders understood government to be a human creation which is best understood in human terms. And they knew that the authority to decide what was democratic, what provided liberty and justice for all, came from themselves and the citizens of the United States. If it did not, what would be the point? How would the U.S. government be new if it claimed godly justification, just as every government in history had done beforehand? No, the Founders did not threaten dissenters with God's fury. They took a Hobbesian view that the government they and the people were creating would live or die on human merits, and in doing so raised the bar for what human law, what government, should accomplish. "Our Nation Was Founded on Judeo/Christian Principles"
Jonathan Rowe judiciously explores the Jaffa versus Bork debate below, and our commenters rightly identify the problems. I adore Antonin Scalia's clarity, and I think he sets it all---and his judicial philosophy---out nicely in this speech about the Supreme Court's increasing invocation of "international law" as "precedent." "[I]t has occurred to me that this notion of an overarching moral law that is binding upon all of the nations of the world -- and with which all the judges of all of the nations of the world are charged with interpreting -- has replaced the common law. Those of you who are lawyers will remember that, in the bad old days, that is to say, before Erie RR v. Tompkins [304 US 64, 78 (1938)], the courts believed that there was a single common law, it was up there in the stratosphere. Now, the state courts of California said it meant one thing, the state courts of New York said it meant something else, and the Federal Courts might say it meant a third thing. But one of them was wrong! Because there really is a common law, and it's our job to figure out what it is." So until 1938, Scalia argues [admits?] that "common law" was the guiding light for judges, and I believe he's using "common law" interchangeably with "natural law" here, as it's in the stratosphere. Do what you think is right, hang the constitution. This seems to put "originalism" or even "original intent" on very shaky ground. "So in those days, any common-law decision of one state would readily cite common-law decisions of other states, because all the judges were engaged in the enterprise of figuring out the meaning of what Holmes called "the brooding omnipresence in the sky" of the common law. Well, I think we've replaced that with the law of human rights. Which is a moral law, and surely there must be a right and a wrong answer to these moral questions...surely there is a right and wrong moral answer. And I believe there is, but the only thing is, I'm not sure what that right answer is. Or at least, I am for myself, but I'm not sure it's the same as what you think." Some excellent points here: Judges had a roughly "common" understanding of natural law, and together built up a rather coherent body of judicial interpretation. Precedent, stare decisis, gathered a certain force and respect. Scalia himself is no radical; a look at his decisions show a certain respect for the body of American common law that has built up over the last 200+ years. And here is the key point: What is the natural law? It's a slippery notion and therefore a problematic notion---the natural law is absolute, but human understanding of it is necessarily subjective. Your interpretation is probably not mine 100% across the board. "[A]nalytical reasons for newly imposed constitutional prescriptions or prohibitions that do not at all rest---as the original bill of rights did not at all rest---upon logic or analysis, but rather upon one's moral sentiments, one's view of natural law, one's philosophy or one's religion...Decisions on such matters, whether taken democratically by society or undemocratically by courts, have nothing to do with logic. So without something concrete to rely on, judicial opinions would be driven to rely on such philosophic or poetic explanations as "[a]t the heart of liberty is the right to define one’s own concept of existence, of meaning, of the universe, and of the mystery of human life." [Planned Parenthood v. Casey, 505 U.S. at __; quoted in Lawrence, 539 U.S. at 574]." And so, Scalia argues (do read the whole thing---my excerpts may have made a hash of his point) that a common understanding of the natural law, and by this he means democracy as expressed through legislation, not the "judicial activism" of a select few, is the most constitutional way to reconcile our laws and the "natural law." Now there's a major aesthetic weakness in his position and philosophy---although Scalia disagrees with Dred Scott because it overturned the Missouri Compromise, which was passed through a democratically elected congress, he cannot summarily declare slavery to be bogus because it offends his moral sentiments. Still, he invokes the Ninth Amendment as a "call to action" [see Planned Parenthood v. Casey]. The Missouri Compromise was patently constitutional in his view, and the Supreme Court was thoroughly wrong in declaring it unconstitutional. It is thought by many historians that by taking moral decisions out of the hands of the people, the Supreme Court in Dred Scott, instead of expediently settling the slavery question as it obviously intended, led to "Bloody Kansas," John Brown's terrorism, and inexorably, The Civil War. Scalia's prescription for the conduct of the judiciary isn't the ideal---the ideal, as Plato points out, is a philosopher-king who would make all the right and just decisions on the spot. We wouldn't need precedent, we wouldn't even need laws, really. But in human history, philosopher-kings come along seldom if at all. For those pragmatists who subscribe to the notion of "a nation of laws, not men"; who still believe that right and wrong are absolutes, even if difficult to discern; and who believe the odds of getting 5 philosopher-kings on Supreme Court are statistically prohibitive, Justice Scalia's thesis of "common law" holds much food for thought. For those who have time, you may want to check out this interesting past debate from National Review that is accessible online. It is relevant to American Creation in that it focuses on how the notion of "unalienable rights" and the organic law of the Declaration of Independence were intended to exist (if at all) in America's constitutional system. I am proud to announce here at American Creation that this posting will arguably be the most bizarre in the history of our blog. To be honest, when I first reviewed this particular book I was expecting something different. But after perusing a few of its pages I am now left completely at a loss for words. The "Autobiography" of George Washington, which was published in 2006, was allegedly written by Edith Ellis, a semi-famous playwright and spiritualist, who claimed she was receiving periodic visitations from George Washington throughout the 1940s and 1950s. Ellis stated that she had been chosen to be the official scribe for the dead angel/general/president because of her “objectivity.” During their various "visits," Ellis stated that Washington would regularly comment on his displeasure for the current state of American society. As a result, the General decided to publish his autobiography to help inspire the wayward American populace. Plans backfired, however, when Ellis passed away in 1960. About 20 years later, another spiritualist named Caroline Myss published the book. Needless to say, the book is filled with obvious historical errors and a number of bizarre claims. Perhaps General Washington went senile in the afterlife and forgot obvious specifics, or perhaps Ellis was prone to delusions of grandeur -- i.e. was a blatant liar. Whatever the case, the book is absolutely laughable. My blessed mother was the one to whom I went to say my prayers each night, while my brothers gathered with my father each morning. It may seem strange to you moderns that we had no food until we had gathered in a room and read a chapter from the Scriptures and knelt in prayer, asking for help to make the coming day a profitable one in mind, body, and soul. Martha was never fond of my service in the presidency...Her concerns were eventually set at ease when she came to the knowledge of God's divine plan...Having sworn an oath upon the Holy Book of our Lord, I set out to restore our nation's Christian heritage. It was ever present in my mind that the peace and prosperity of America was eternally indebted to the merciful master of heaven. So if you are even in need of a good laugh, pick of a copy of An "Autobiography" of George Washington. I promise that it will bring a smile to your face even on your worst days! With all of the over dramatic political ads that I am sure you have all grown sick of, I thought this might be a nice respite. I have to give fellow contributor Caitlin Hopkins credit for the majority of this piece, since I found the following video on her excellent blog, Vast Public Indifference -- which you all must subscribe to if you have not already. "The legitimate powers of government extend to such acts as are injurious to others. But it does me no injury for my neighbour to say there are twenty gods, or no god. It neither picks my pocket nor breaks my leg." Anyway, here is a funny youtube take on the 1800 campaign against Thomas Jefferson. Enjoy! How America Could Be a "Christian Nation"
Misunderstanding the Phrase "Religion & Morality"